Our game room is fully air-conditioned and has a 7' slate bed pool table, foosball, and a DVD player. This room also has a 1080p projector that can be projected on to a 120" professional grade screen. We also have board games and a large collection of DVDs for all ages. The The game-room is decorated to highest standards. As always we say ..."If there is a garage door - it is a garage, not a game-room!" Our large 14’x30’ heated Swimming Pool and Spa are south-facing and have the unique advantage over many other villas in that the entire pool and spa area will be soaked in sunlight all day long. It is surrounded by a large extended full width paved patio and a screened lanai with cooling ceiling fans should you prefer to sit in the shade. The pool deck is furnished with chairs, tables, and beach beds which allows you to just lie back, relax and enjoy the Florida sun. If you find the pool is a little cool for your liking, it can be fully heated at an additional daily charge (recommended for October to March). The pool deck is fully screened which helps to keep the pool clean and the wildlife out. The pool is serviced weekly by professionals so you can be sure it is clean and safe to swim in. The luxurious raised Spa is a great way to relax and is able to accommodate up to four people at once. Not a bad way to discuss tomorrow’s adventures! Those guests traveling with little ones will be glad to know that the Pool area has a complete child safety fence. In addition all doors leading to pool are alarmed. Pool and Spa have privacy from the neighboring homes on both sides due to judiciously placed shrubs. Living Room of our home is spacious, with a comfortable sleeper sofa, complemented by love seat, coffee table, and two end tables with lamps. Please note the foos-ball table pictured here is part of the game-room. The family room with its two-story ceilings is spacious, with a comfortable sofa, complemented by love seat, coffee table, and two end tables with lamps, 32” flat screen TV, a DVD player and Wii Games console with games. Our vacation home has a well-equipped kitchen that makes food preparation a breeze while you are on vacation. To start off, this kitchen has an oven and a cook-top stove to make special meals of your choice and is complemented by a refrigerator with freezer, microwave oven and automatic icemaker. This kitchen is “complete” with dinnerware, silverware and glassware settings for 14 (including wine glasses), kitchen towels and oven mitts, knives and cutting board. It also offers various kitchen utensils including corkscrew and grater, Salt and pepper shakers. There are plenty of pots and pans, baking sheets, microwaveable dishes. 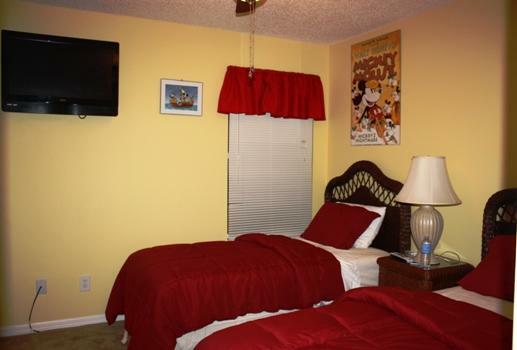 This bedroom is decorated nicely with Mickey theme and ideal for adults and kids alike. This bedroom also has two twin beds, a 24" flat screen TVs with cable and DVD player. This bedroom is decorated with beach theme and has two twin beds that accommodate two kids. This bedroom also has a 24" flat screen TV with cable and DVD player. The sofa in the living room also turns to a sleeper bed to accommodate two persons.